The map is divided into 75 different provinces on water and land. Land provinces may be coastal or inland. 34 provinces have a supply center and are marked with a dot/star. St. Petersburg, Bulgaria and Spain, there are split coasts. A fleet in those provinces must be on one coast or another. 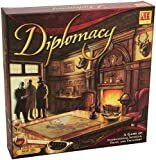 Diplomacy should best be played by 7 players. Every player chooses one of the 7 major powers in Europe: England, France, Germany, Italy, Austria, Russia and Turkey. All Players start with 3 or 4 supply centers and these are called "home centers". Rookie players best choose for France or Turkey as these powers are more forgiving of tactical mistakes than the inner powers (Austria, Germany and Italy). For 6 players, I advise you to play the Chaos Italy Variant. For less than six players the Escalation Diplomacy Variant is an option. This version can be played as a World War I simulation. One player controls England/France/Russia while the other plays Austria/Germany/Turkey. Italy is neutral and Italian territory can't be entered. The game begins in 1914. Before the Fall 1914 adjustments, flip a coin. Italy joins the winner of the toss in Spring 1915. The first player to control 24 supply centers wins. This is also an enjoyable way for two new players to learn the rules. Eliminate Italy and Germany (as described for Italy below). Italian units hold in position and defend themselves, but don't support each other. Units belonging to any of the players can support them in their holding position. If Italian units are forced to retreat, they're disbanded.